I sat down with Bruce and Debbie Hersey to talk about the Open Door Mission in Glens Falls, NY. Read our interview to find out what they do, how they got started, and what you can do to help. 1. How long has the Open Door Mission been present in Glens Falls? The Open Door Mission started out of Ernie Blanchette's concern for having a shelter in Glens Falls. 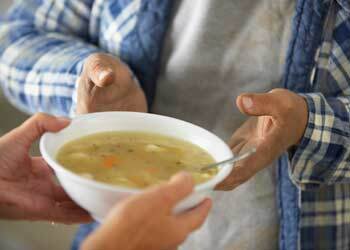 After a feasibility study, it was determined that a soup kitchen was of more immediate need. The Open Door served its first 13 hot meals from an RV in Peter Shabat's parking lot off of South Street in Glens Falls, NY, on September 5, 1991. When it became too cold to serve outdoors, Peter Mastrangelo (representing Glens Falls National Bank) offered us the bank's "community room," and later, a store front on South Street. In October of 1993, we were offered an incredible opportunity to move to 24 South Street, and from there to our current location at 47 Lawrence St.
2. Are there other Open Door locations? Our building on the corner of Lawrence and Walnut Streets in Glens Falls, NY, is the only facility which we own. However, out of that building numerous pick-ups and deliveries occur, some of which are sent to distribution sites in the region which we have established. 3. How many people have you helped over the years? It is difficult to state an actual number, but I would say multiple thousands. How many meals do you serve per week? Although the numbers vary throughout the month and time of year, we usually serve between 25 and 50 individual people on site, with around 10 take outs for lunch and between 20 and 30 take outs for the dinner meals (for specially identified shut-ins and other needs). In addition, we have a community distribution person who receives and distributes food to 100 people, 2 to 3 times a week. 4. Where does the food and money come from? Approximately 10% of our operating budget comes largely from grants from the Regional Food Bank (for the purchase of food items) and the Glens Falls Community Block Grant. There are occasionally other grants which we receive, but the majority of our funding comes from free will donations from individuals and businesses. Some of our on-site food is purchased through the Regional Food Bank grant, but the majority of the food which we use (and all the food that we distribute) is donated by individuals, corporations, and organizations in the community. 5. I ran in the Rotary 5K race last spring, are you scheduling more fundraiser events like that? The two major fundraisers which we actually sponsor and organize are the annual "Coming Together For Hope" festival in Crandall Park, Glens Falls, on the second Saturday in August, and the "Big Balloon Breakfast" for the Adirondack Balloon Festival on the 3rd weekend after Labor Day each September. Other fundraisers, like the Rotary 5K Race, "Sing For Someone Else's Supper", food drives, etc., are actually sponsored by individuals or organizations on our behalf. 6. I see that you require regular clients to do chores. Why? What if they refuse? While we happily provide meals free of charge to those in need, we do feel that it is important to stress the importance of work and respect, and the part that they should play in everyone's life. Our philosophy on chores---that everyone who comes to eat on a regular basis must regularly sign up for one of four chores: wiping down tables, taking out the garbage, sweeping and mopping floors, and washing dishes----is based on the Biblical principle that, "Those unwilling to work will not get to eat" (2 Thessalonians 3:10b, NLT). If clients refuse to do chores, they are asked to leave and not return for a week. We will not let anyone go hungry---they can get a sandwich or two to eat---but they will not be able to come in, sit down, and partake of the full meal that is offered. 7. Do you offer clients anything other than a hot meal? In addition to hot meals and emergency food support, the program provides guests with encouragement for daily living, including sponsorship of our own 12-Step program, haircuts, an informal mentoring program, informal monitoring of elder, spouse and child abuse and neglect, and provision of support to continue in community-based substance abuse, mental health, and probation programs. Information, referral, and advocacy are regularly provided. All services and programs are provided free of charge. We offer this care to all people, regardless of race, gender, sexual orientation, national origin, creed, or religion. 8. If someone in need would like assistance from The Open Door Mission, what should they do? Our first contact usually occurs with people coming to the Mission to have a free meal at our soup kitchen. They talk with Bruce, the Executive Director, or Debbie, The Assistant Director, who informally assess their needs and then make necessary referrals. Additionally, people occasionally call for information and referrals by telephone. We work closely with other social service agencies in the region to avoid duplication of efforts and to provide the best possible solution for each person's needs. 9. If someone would like to volunteer at the Open Door Mission, what should they do? We always recommend that those who wish to volunteer check out our website (www.opendoor-ny.org) if at all possible to see if there is an area which interests them. They should then contact Debbie Hersey at The Open Door Mission at 518-792-5900 or for more information and to discuss possible volunteering opportunities. Certainly The Open Door Mission could never do all that it does without its more than 500 volunteers, and we are grateful for each person and organization which helps provide these necessary services.